Water treatment startup Ostara Nutrient Recovery Systems has a secret weapon for greener grass — sewage. Yesterday, the Vancouver, B.C.-based startup said it has raised $10.5 million in private equity financing for its water treatment system that removes phosphorus and other nutrient pollutants from wastewater and turns them into fertilizer. The financing was led VantagePoint Venture Partners, which was joined by Foursome Investments Limited. The money will be used to install the system at commercial water treatment plants in North America, including the company’s first U.S. deployment near Portland, Ore., Ostara says. Founded in 2005, the company has been operating its system at a commercial-scale water treatment plant in Edmonton, Alberta, since 2007. Ostara says its technology can process sewage sludge liquids in a way that reduces operating costs, increases overall plant capacity, complies with environmental regulations and produces revenue from the cleaned-up byproduct. Ostara licensed its technology from the University of British Columbia. The technology uses a proprietary fluidized bed reactor which mixes the wastewater with magnesium to force the phosphorus to precipitate. The reaction pulls out 85 percent of the phosphates, which form into granules, the company says. 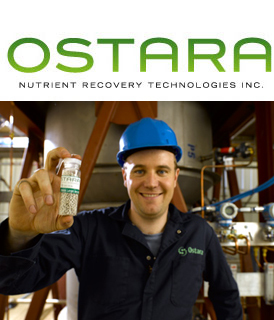 Ostara’s system can be implemented at plants that use biological phosphorus removal and anaerobic sludge digestion and helps boost capacity and reduce operating costs by pulling out the crystalline phosphate, which could otherwise clog the system and take additional energy to pump. The end result is sold to golf courses and farmers under the brand name Crystal Green. The next step is implementation at the Durham Advanced Wastewater Treatment Facility in Tigard, Ore. The facility is operated by Clean Water Services, which signed a contract with Ostara earlier this month to construct a $2.5 million reactor at the Durham facility with the aim to get the reactor operating by spring 2009. Clean Water Services expects that between the expanded capacity and revenue generated by fertilizer sales it will see a return on its investment within five years. This is amazing were do I get more info. My husband works as a chemist in the waste water management and has ideas about this type of thing and others. This is the way of the future to use nature by her laws for our benifit, and her preservation. Use biosolids already proven safe. Anyone with info please let send it to me. Husband was extatic when I showed him the article.